Ever since I became an Aldi shopper, I've been certain (though I have no concrete evidence) that one way Aldi keeps their quality high and prices down is to "rent" the factories of name brand products to make their own generic brands. I've tried many of Aldi's products and can tell you with confidence that the great majority of their generic brands taste EXACTLY like name brands. If you put a bowl of Aldi's Rigged Potato Chips next to a bowl of Lay's Ruffles, I bet it would be impossible to tell the difference. Don't they look somewhat familiar? They caught my eye right away because they looked exactly like the packaging of Girl Scout Cookies! Could it be that Aldi had the chance to "rent" the factory where Thin Mints and Samoas are made??? Oh yeah, and they have the Peanut Butter 'Tagalongs', too! I brought them home and had family taste test. Our conclusion was that these WERE real Girl Scout Cookies beyond a shadow of a doubt! Of course, I'll still be purchasing cookies from the Girl Scouts when that time of year rolls around. Back in the day, I did my fair share of cookie selling and the Girl Scouts is a great organization to support. But hey, while we're waiting for the doorbell to ring, how about a little "fake & frugal" cookie indulgence (they're 1 Point each on Weight Watchers)? I couldn't agree more - they're FABULOUS - and a perfect score for the Fake-It Frugal! Those cookies would STILL be a bargain at twice the price! Yay!! thanks for posting this! Dollar General also has a line of knock off Girl Scout cookies that are under $2 and delicious!!! And Ingles' chips taste exactly like Wise brand. I had never heard of ALDI until this post so I looked it up. And there is actually one not too far from me. GO FIGURE! I probably drove by it a couple of times and just didn't know what it was. I will try it this week and see how I do. Will definitely try the cookies when I do. I bought the fake "Tagalongs" this past weekend and brought them to my daughter's house. You should have heard the screeching from all of my children when they saw them! They all said they taste exactly the same!!!! I miss Aldi's, since we moved from the Midwest to the West Coast. Hopefully, someday, they will make it out here. You are right! I was shopping at Aldi with my husband last week (a rare event) and he zeroed in on these immediately! We tried the mints and the fakey Samoas. HOLY COW! Identical. Another win for my favorite store. I picked up both varieties of these cookies at Aldi, the Benton's Fudge Mint Cookies resembling Girl Scout Thin Mints, and Benton's Caramel Coconut Fudge Cookies resembling Girst Scout "Samoas" cookies to taste-test them. I love comparing tastes of products! First the Samoas-like cookie rundown: Very close but not quite the same. Quick bottom line? If you love real Samoas, at $1.69/box, these are a no-brainer. The texture is the same. Coconut, same. Cookie, same. Caramel, same. Fudge? Not. Real Samoas have a darker chocolate drizzle whereas the Aldi cookie seems to use a milk-chocolate. But at $1.69/box this is a trifling technicality for arguably the best cookie (or candy?) ever conceived. The Thin Mint-like cookies are another story. Quick bottom line? If you like Girl Scount Thin Mints, go to Aldi and buy CASES of these because they are BETTER than real Girl Scout Thin Mints. 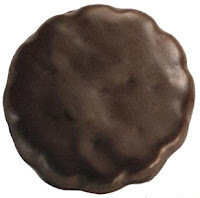 The most recent genuine Girl Scout Thin Mint cookies I tasted were disappointing. They tasted waxy and, quite frankly, gross. The Aldi version are the Girl Scout Thin Mints of yore: tender, melt-in-your mouth cookies. Unfortunately, over the years, Girl Scout cookies have faced considerable inflationary pressure under costs of ingredients, production, and distribution. This has resulted in an ever increasing gap between the increasing cost of a box of cookies, and both the quality and quantity of the cookies inside the box. So do the Girl Scouts a huge favor. Buy these cookies at Aldi for $1.49/box (or $1.69/box for the Samoa-like cookies) and sell them to neighbors and co-workers for $5.00/box. Then donate all your cash profits to your local Girl Scout council. We have an Aldi about a mile and a half from my house. I've never been inside. Well now I think that is going to change thanks to your blog post. =) Thin Mint look-a-likes, here I come!! New reader and commenter too. I went this weekend, and my Aldi didn't have these cookies. So sad. I also was not impressed in general with the store, I think that the one I went to just wasn't very large. I just got the chocolate mint kind and the peanut butter patties. THEY ARE AMAZING! As a girl scout and cookie lover, I might have to convert to these cookies and just end up donating instead of buying. I just hope they stay around. I found them on the mark down aisle for $1 a box in Atlanta. Don't leave me Bentons Best! While the fake it ones are great, especially during the year when there are none of the real ones to buy, please remember that when you buy Girl Scout cookies, you are helping the girls and not just getting something enjoyable. Keebler has made knock off versions too. They're still expensive for cookies (2.50-3/box) but you can often find them on sale and use coupons to reduce the cost. I rarely buy them for more than $1/box. Keebler and George Weston Bakeries are the two companies that make all the Girl Scout Cookies since 2008. Depending on where you live, there are 28 varieties to choose from. These two bakeries (and their subsidiaries) are allowed to sell cookies very similar to the Girl Scout cookies, and they tend to attempt to cycle them when Girl Scout sales aren't going on to keep from competing directly. Walmart has been under pressure for "stealing" the look and taste and competing directly with the scouts. I worked for a, no name, "major chip manufacturer" and I can tell you for a fact that the potato chips are the same. They are put into a different bag and shipped to many stores. The flavored chips are sometimes changed for the big brand bag but not always. Yum, yum yum,! I can't tell the difference between these and girl scouts. For only $1.29! C'mon. the chewy choc chip cookies in the red packaging "benton's", do not buy these. they used to be perfect chewyness and texture and light brown color. then about a year ago, for no reason, they started literally burning the cookies to the point of dark bron blackened color. after 3 purchases over a months time, i gave up on them. a year later today, i bought a package to see if that was just a "fluke series of bad batches", and to my dissappointment, it was not. the cookies are still overcooked and black in color and taste horrible. do NOT buy these cookies. My local Aldi doesn't carry the Bentons Thin Mint cookies but they carry the fake Samoas and Tag-alongs which are delicious. I went yesterday to check again and still no thin mint cookies so I went a few doors down to Dollar General and they had their brand of the thin mints, samoas and tag-alongs. I bought the thin mint and samoas and they are so good I couldn't tell a difference! I had to hide them before I eat them all! The Aldies brand chocolate sandwich cookies (and double filled) are a delicious and reasonably priced alternative to the, recently moved to Mexico, Oreo cookie. I love Aldi's!!!! The cookies are Exactly the same. They also have really good frozen shrimp,and all the crackers are equal to or better than the name brands. I like their version of triscuits. way better oh and flavored coffee creams too!